June 11-13th. I’m done with my first days at the Camp and I think it’s awesome! On the 11 of June I arrived at Whitehorse airport, while I was walking around waiting for my luggage to arrive I felt a bit lost. I was in a small town way up in the northern parts of Canada with no battery life in my phone. I didn’t know what my host looked like. But it didn’t take long before a man walked over to me and asked if I was Johan. He introduced himself as Wes. A friend of the Camp and his son joined us as we drove off to get a bite. Directly after we went to the Waterplane base. We flew over snowy mountain tops and landed nicely on wolflake. Our final destination. During the days I’m working with a little bit of everything but in the evening the rewards will come, fishing. The first night we went out fishing it wasn’t much activity on the water but after a while Wes got a nice little trout and I had a hard and aggressive take that bent my new flyrod all way down to the handle, it was love at first strike. The next night I was hungry for revenge on these aggressive fish and I really got it. In just one hour I caught four nice “lakers” and missed several and in my point of view they were nice fish but Wes just told me that they were just small ones. The biggest one was about 2,5kg and it put up a good fight. On the way home I was wondering what to do if a fish over 10kg would take my fly, I guess it would be a hell of a ride. 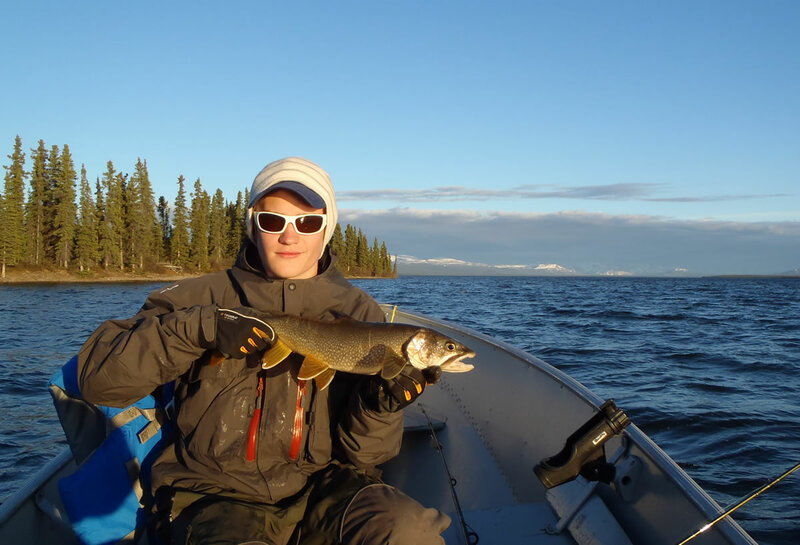 Anyway, let me tell you about my fist landed lake trout. After a fifteen minute boat ride, Wes slowed down and casted his lure out. While I was working on getting the fly out on the water he said – let’s hope they’re biting today. After just a few minutes of slow trolling Wes got a take and landed his first fish for the evening. He had some more bites and landed one more fish but I, I got nothing, not even a little nibble. I put on the fly that Wes gave me on the shore before we went out on the water and almost instantly I got this furious take and after a short but tough fight I could land my first lake trout ever. And after a great fishing trip, what could be better than sliding down in the hot tub with a cold drink and some nice people after a long day of work and fishing. “Picture of my first laker” This is me reporting from heaven, Over and out. Johan.